Patients advocates with a wide range of health conditions—including neuroendocrine tumors, lymphoma and cancers of the lung, breast, and prostate—flew into Washington, DC, for March 14 meetings on Capitol Hill to urge support for a bill that would require the Centers for Medicare & Medicaid Services (CMS) to reclassify diagnostic radiopharmaceuticals as drugs. Patients rely on the radiopharmaceuticals for diagnosing and monitoring their conditions, as well as guiding therapy. This was a joint effort by SNMMI, the Medical Imaging and Technology Alliance (MITA) and the Council on Radionuclides and Radiopharmaceuticals, Inc. (CORAR), which was organized by the Alpine Group. 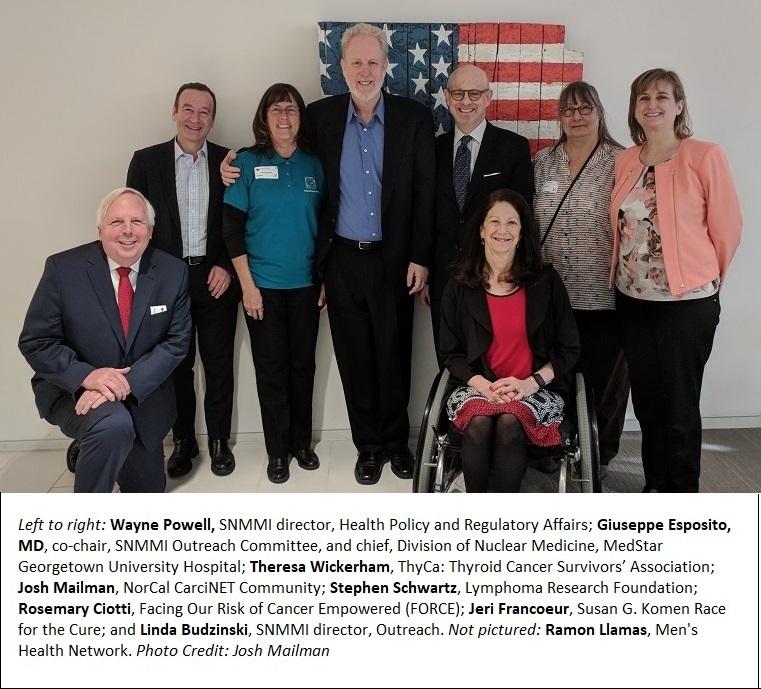 The patient advocates, members of SNMMI’S Patient Advocacy Advisory Board, were joined by representatives of CORAR, MITA, Alpine Group, Curium, AAA, GE Healthcare, Avid/Eli Lilly, and Massie Partners. Obtaining the nuclear medicine scans that use these FDA-approved diagnostic radiopharmaceuticals can be problematic, as CMS currently misclassifies them as supplies and has them in bundled payments under Ambulatory Payment Classifications (APCs) in the Medicare Hospital Outpatient Prospective Payment System (OPPS), even though Congress, in the Medicare Modernization Act of 2003, specifically designated all radiopharmaceuticals (therapeutic and diagnostic) as drugs. Payment based on APCs means hospitals are reimbursed based on the average of all costs within the APC. This methodology works when the costs within an APC are similar. However, CMS packages a number of diagnostic radiopharmaceutical drugs into APCs, even when their costs vary widely. As a result, the cost of some diagnostic radiopharmaceutical drugs significantly exceeds the total APC procedural payment, which is intended to adequately cover the combined radiopharmaceutical drug and nuclear medicine procedure costs. This provides a strong disincentive for hospitals to utilize newer, more targeted diagnostic radiopharmaceutical drugs and serves to discourage investment in research and development. While CMS has packaged diagnostic radiopharmaceutical drugs into APCs for over a decade, the nuclear medicine industry has evolved; industry innovators are creating tailored diagnostic radiopharmaceutical drugs for difficult-to-diagnose disease states. However, CMS payment methodology has remained stagnant under the OPPS. The net effect of this policy is to stifle innovation and jeopardize Medicare beneficiary access to effective nuclear medicine procedures. SNMMI, MITA and CORAR have been advocating for reclassification for a long time, and they are advocating for legislation to resolve this problem. More support is needed, and that’s where the patient advocates are key. After a breakfast meeting, they spread out to visit with key Congressional staff on the Hill. The goal is to ensure that all diagnostic radiopharmaceutical drugs are adequately reimbursed by CMS in order to safeguard Medicare beneficiary access to new and innovative diagnostic radiopharmaceutical drugs used to diagnose and monitor a wide range of diseases and to help deliver targeted treatment. We anticipate that a bill will soon be introduced in Congress. As soon as that happens, we will be asking all SNMMI members to contact their representatives requesting co-sponsoring of the bill.